Japanese telecommunications company SoftBank unveiled a spiffy new smartphone tonight by the name of "GALAPAGOS". Sporting a high definition 3D display, the phone will feature a wide variety of 3D media without the need for glasses, much like the Nintendo 3DS. Capcom will be a major supporter of the device and plans to roll out quite a few titles. According to various Japanese news outlets, "Rockman 3D" was announced as one of the initial titles for the phone, available as pre-installed software. Unfortunately, the game is not quite as neat as its title suggests: it's nothing more than a port of Rockman 1 with the option to display the game in stereoscopic 3D, emulating the illusion of depth. Pictured above, you can see a screenshot of the game running on Galapagos, sans the 3D effect. 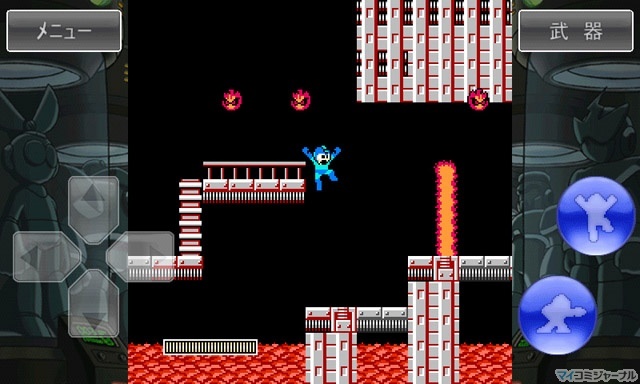 Much like the Mega Man 2 iPhone port, gameplay will be carried out via the touch screen, however some models of the phone will apparently support a slide-out keypad -- an implication that an alternate control scheme is possible. Rockman 3D launches with the phone in mid-December, exclusive to Japan. Update: Added/omitted minor details; larger screenshot added. Too bad I'm not Japanese. Meh, it just sounds like the Mega Man 1 equivalent of the 3DS Mega Man 2 port. I'm not very impressed. So, it's like how the 3DS is getting MegaMan 2, except that 3DS is more world wide. Yep, so Protodude isn't American. Seriously, can we be done with those now? I still don't know how iPhone games still sell.